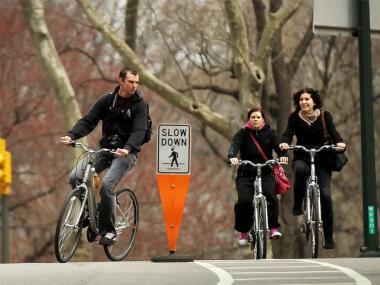 Community Board 7 members want the city to ban cars in Central Park this summer. UPPER WEST SIDE — Support for a Central Park car ban picked up speed Monday night when Community Board 7 members called on the city to test drive a vehicle-free park this summer. Parks and transportation committees of the board, which covers the Upper West Side, voted unanimously in favor of banning cars from July through early November. The test run would give officials a chance to study how it affects traffic citywide, community board members said. That data could be used when considering a permanent ban, which City Councilwoman Gale Brewer proposed in March. Brewer's bill would keep cars out of Central Park and Brooklyn's Prospect Park. They would still be allowed on Central Park's crosstown transverses, but banned from East and West drives that make up "The Loop" around the park. Brewer floated her bill during controversy over cops ticketing cyclists for speeding and running red lights in the park. "One of the things underlying that whole discussion is that when you've got cars and bikes and everybody else using the same roadways, you've got conflicts," Community Board 7 parks committee co-chair Klari Neuwelt said on Monday night. Neuwelt and other community board members said getting rid of cars would make Central Park safer, as increasing numbers of park users compete for a finite amount of space. "The loop is the most popular part of the park, and right now it's a free-for-all," said Community Board 7 member Ken Coughlin, a longtime advocate for a car-free park. Removing cars would also make exercising healthier for cyclists and runners who would breathe in less polluted air, Coughlin said. Community Board 7 wants the Department of Transportation to conduct a study during the trial ban to see how traffic patterns change. Some have worried that a car ban in the park could clog nearby streets such as Central Park West and Columbus Avenue. The DOT could enact the temporary ban without City Council legislation, Neuwelt said. Community Board 7's full board will vote on the car-free trial run at its June board meeting.